It’s a wrap!!! The second event of the Junior/High School season and first of the NW Region is over and here is what we can share with you about the Blackwater River from Milton, Florida. First and foremost, this is an awesome fishery. The City of Milton is very proud of this body of water and rightfully should be. It is a beautiful place and has a lot to offer. They are doing a great job with their downtown riverwalk along the shores of the Blackwater River and has a beautiful park area for hosting events. They were great to work with leading up and during the tournament. Thank you for being the Title Sponsor and for all the support you provided. This was the first event the Florida B.A.S.S. Nation has ever hosted on the Blackwater River and will not be the last. Everyone seemed to have a great time and based on the dock talk coming from the anglers before take-off the morning of the tournament, the fishing definitely improved. This tournament included 30 teams/60 anglers (25 high school teams and 5 junior teams) from six different school/clubs around the state. All but four teams weighed in fish, which amounted to 82 fish being caught and all were released alive back into the river. The average weight per team was 2.72 lbs. 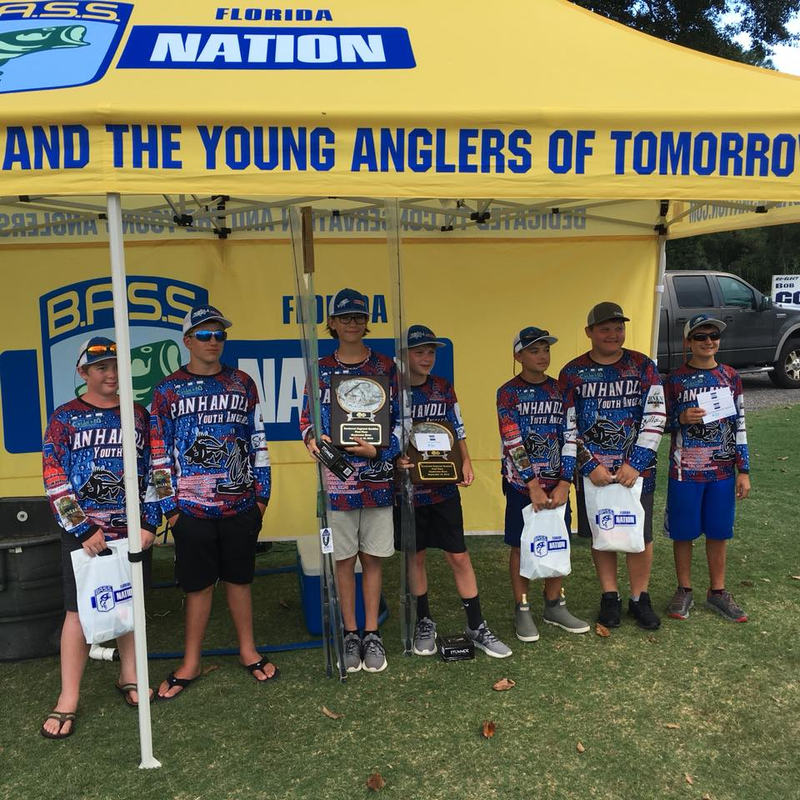 In the Junior Division, the local team of Ian Rutland and Max Hondorp of the Panhandle Youth Anglers took first place with a weight of 5.84 lbs. This was solidified by the big bass in the Junior Division that weighed 2.14 lbs. Second place went to the team of Drake McGlon and Kayden Brooks of Quincy Junior Bassmaster with a weight of 3.64 lbs. In the High School Division, top honors went to the team of Ryan Padgett and Thomas Nash of Columbia High School Bassmasters, which had a weight of 7.31 lbs. The second-place team of Remington Potter and Andy Revell of Quincy High School Bassmasters was not far behind with a weight of 7.07 lbs and the second largest fish weighed in for the day that went 3.25 lbs. The big fish in the High School division was 4.25 lbs and was caught by Chase Hubble and his partner Chase Givens of Strawberry Crest High School located in Plant City, Florida. Third place went to the team of Giancarlo Russo and Evan Zacherl of Quincy High School Bassmasters with a weight of 6.34 lbs. Congratulations to the winning teams and thanks to all the junior and high school anglers that participated in this event. These events would obviously not be possible without your support. Also, thank you to the boat captains and the parents for coming out and supporting the event. Next up is Lake Okeechobee October 6th and 7th from Scott Driver Park in Okeechobee City. Registration is now open. Look forward to seeing everyone there.